Council for America fights to maintain the sovereignty of the United States. American sovereignty allows the people of the United States to enjoy liberty and freedoms that no other people in the world have. The independence of the United Sates has been purchased and continues to be purchased with the blood of many brave Americans. It is our responsibility as American citizens to defend our nation’s sovereignty so future generations will also know the freedom that our forefathers have bequeathed to us. Council for America was founded to help defend America’s sovereignty through providing information to the American people about threats to it and helping Americans to meet those threats through specific actions that protect and expand American sovereignty. Council for America tracks Congress and the Executive Branch. For the United States Congress, an annual Scorecard of the U.S. Senate and U.S. House of Representatives evaluates the performances of all Members of Congress on sovereignty related issues. The annually published “Sovereignty Scorecard” is the only Congressional rating that specifically deals with votes in the Congress each year that have an impact on American sovereignty. Numerous other UN treaties in which the new Administration seems to want to entangle our country. 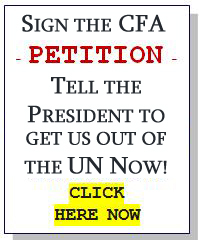 In particular, the Americans for Sovereignty® project has provided a critical assessment of the role of the United Nations and its allied international organizations in their attempts to establish global governance at the expense of American sovereignty.